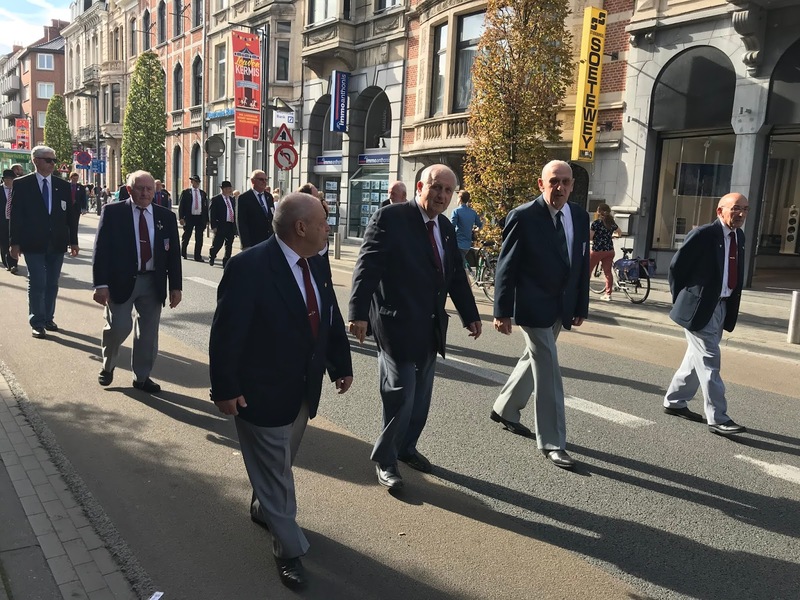 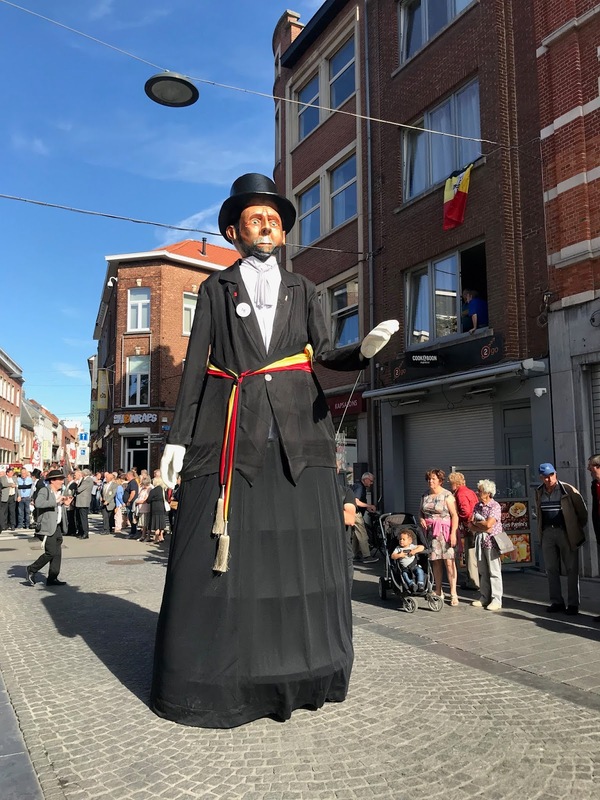 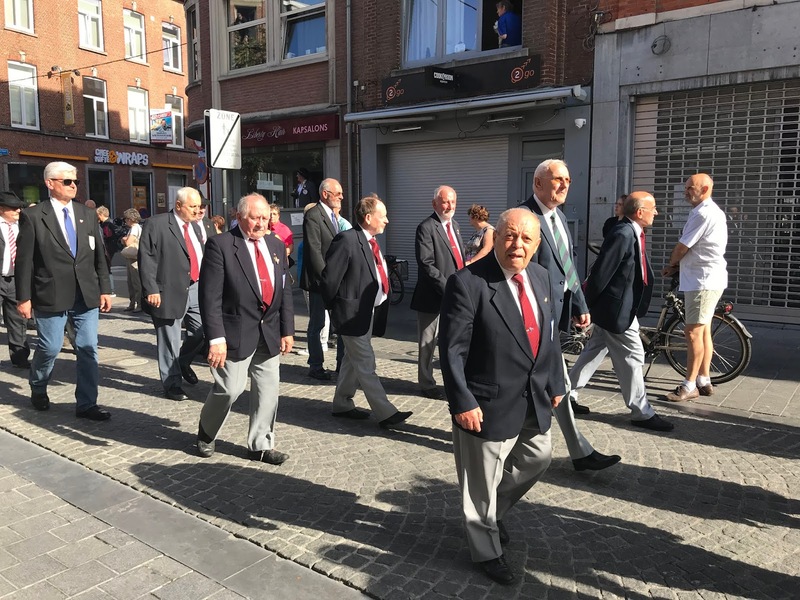 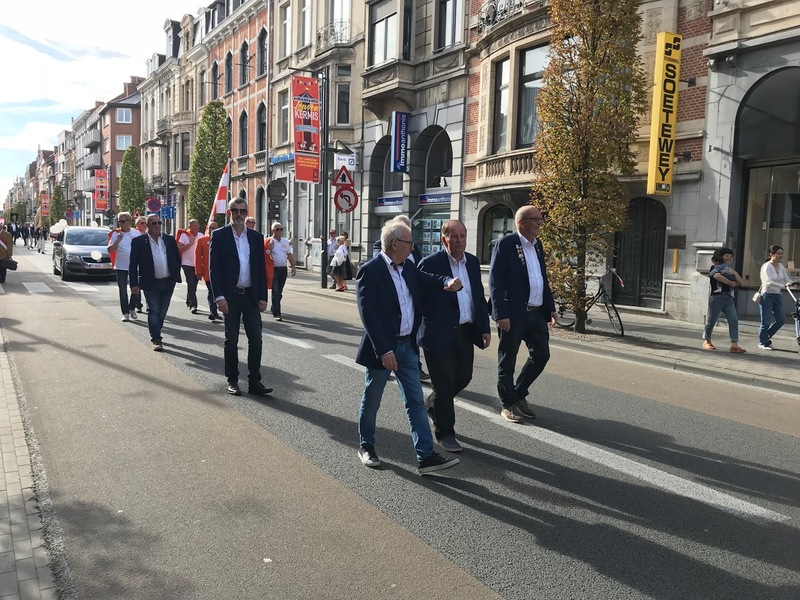 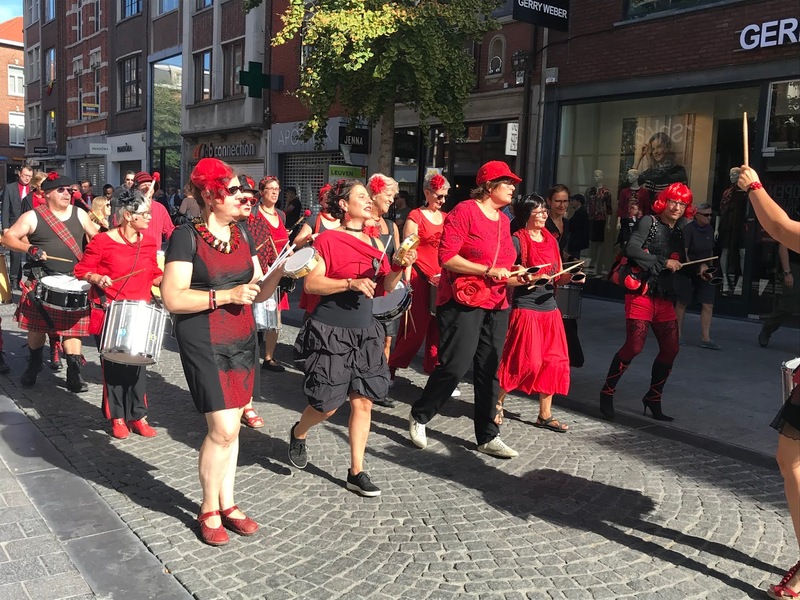 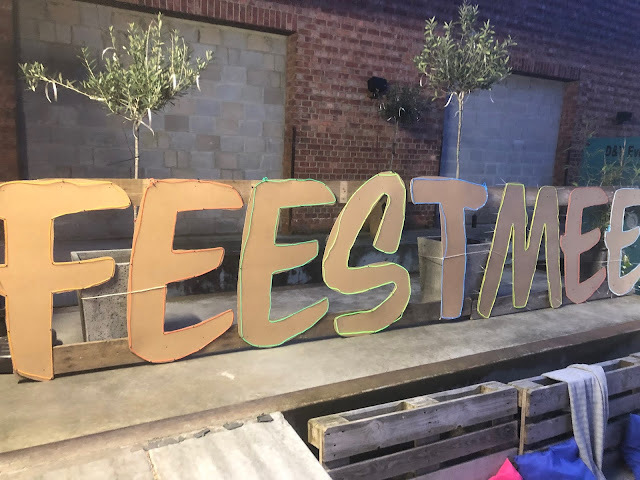 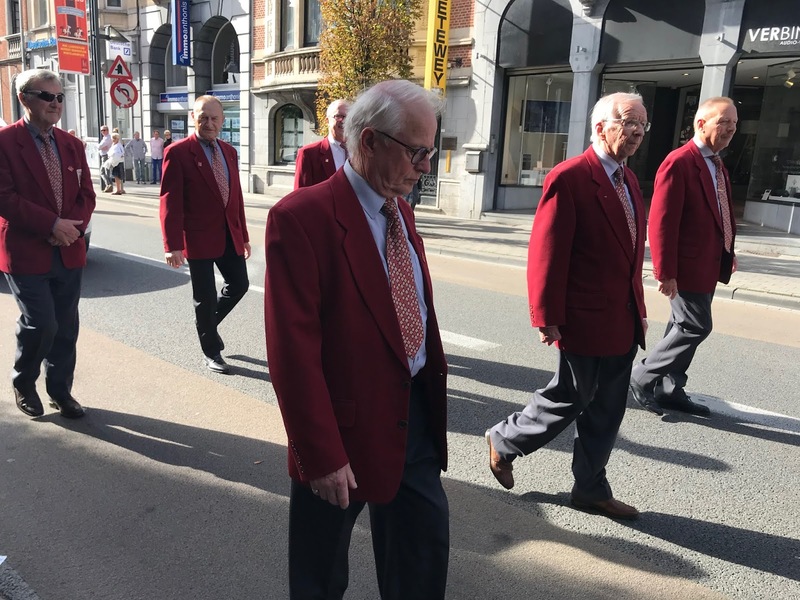 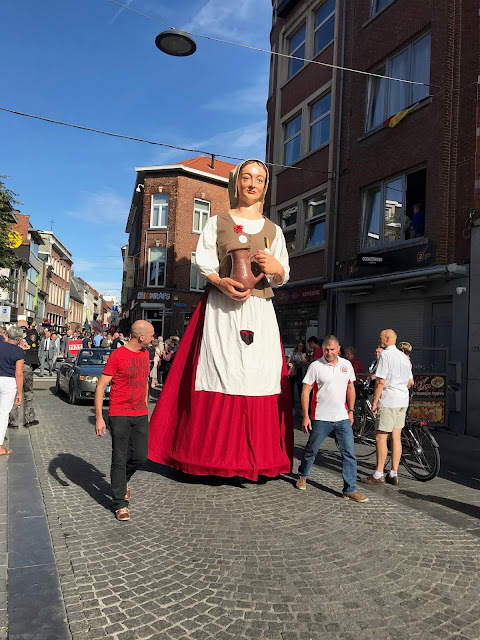 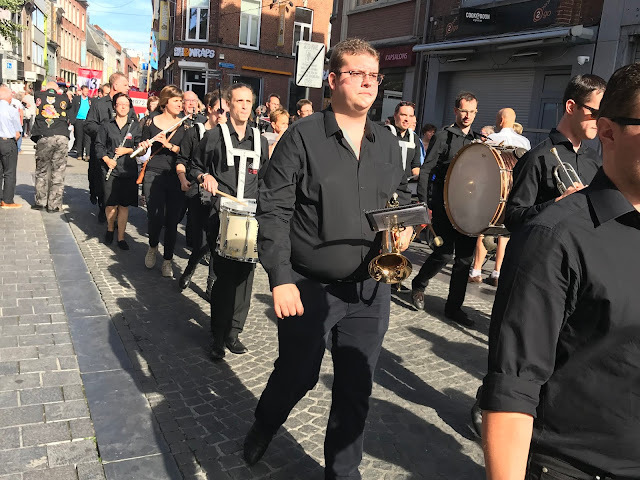 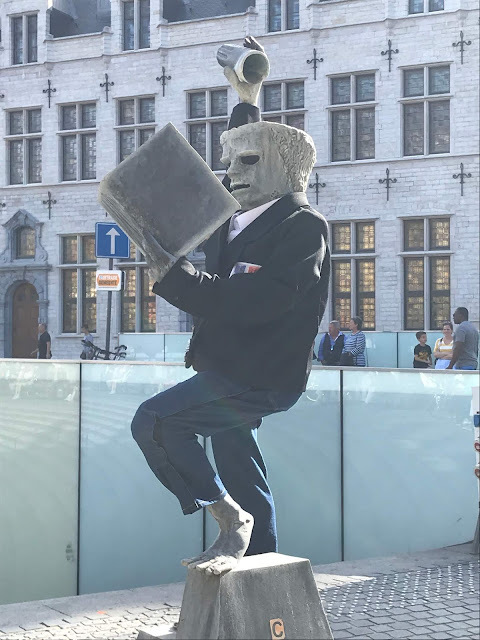 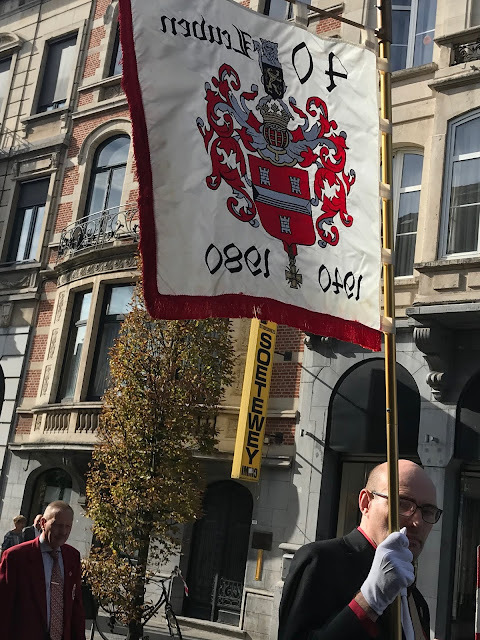 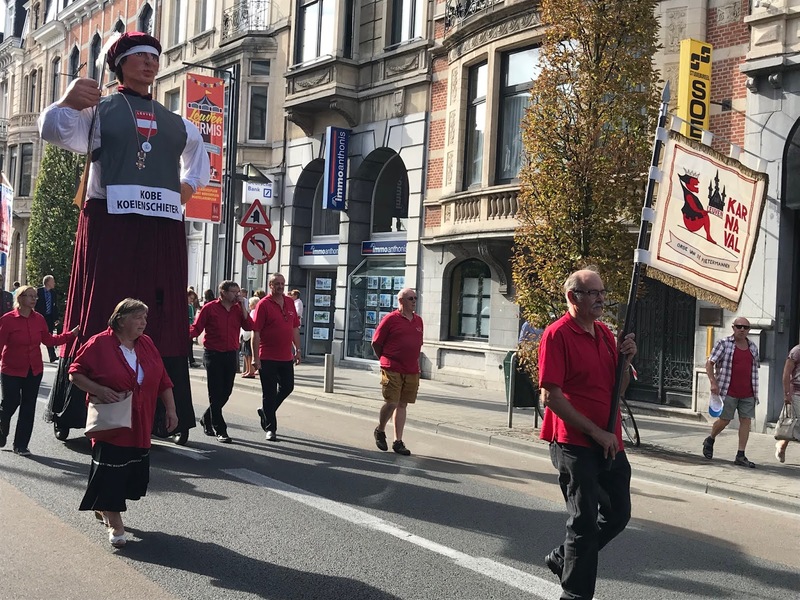 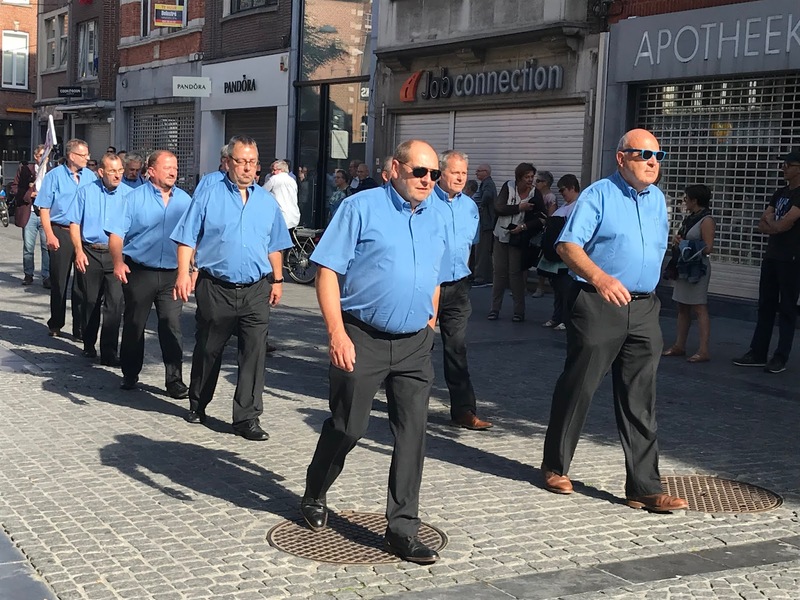 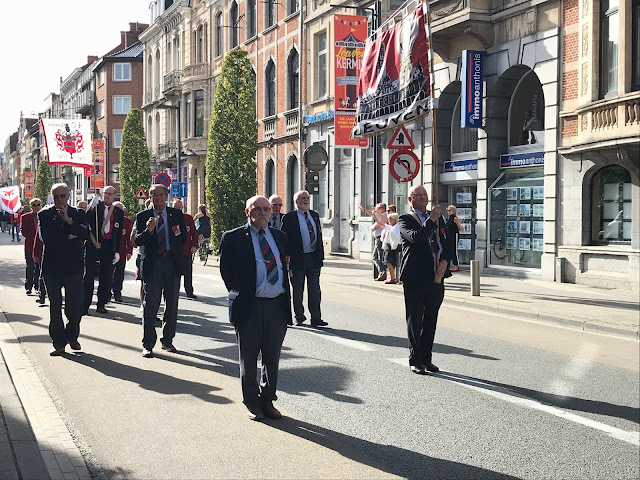 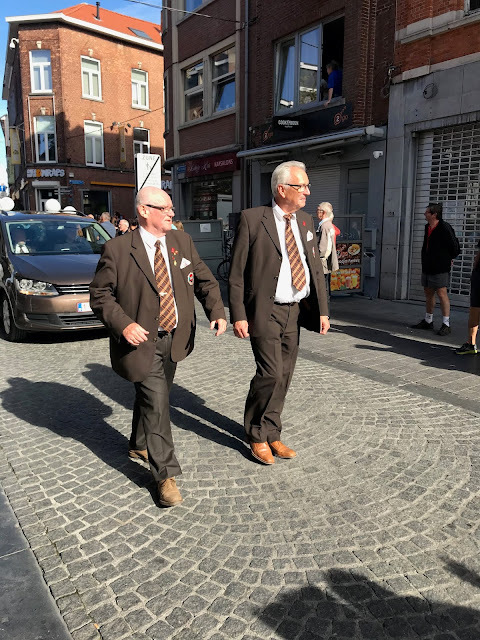 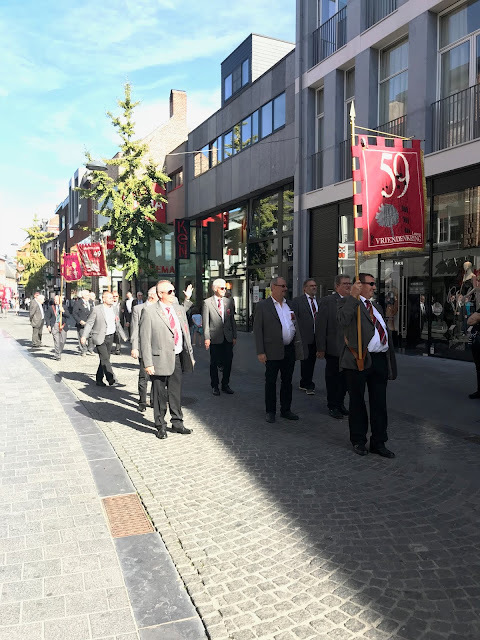 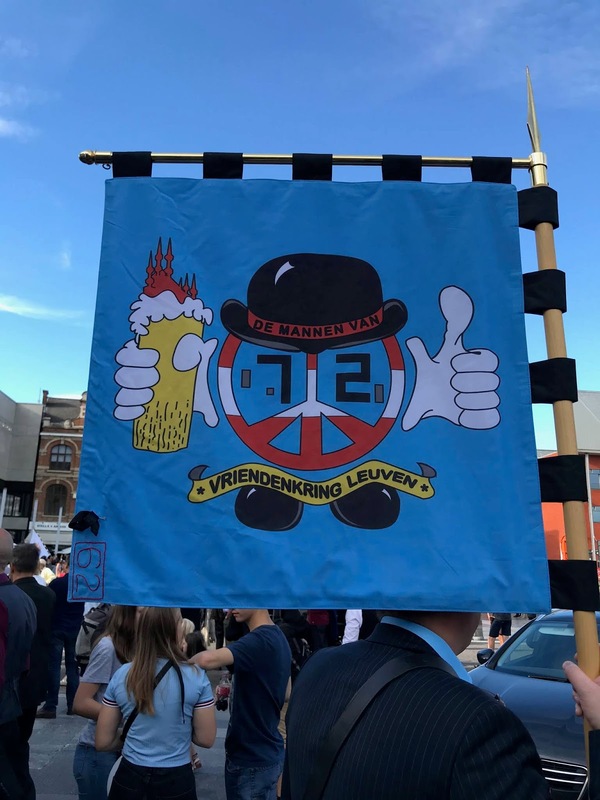 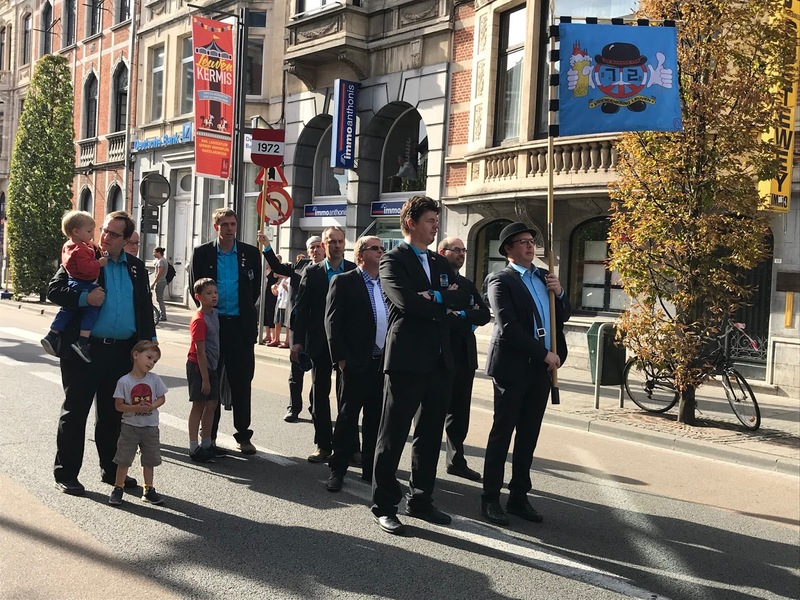 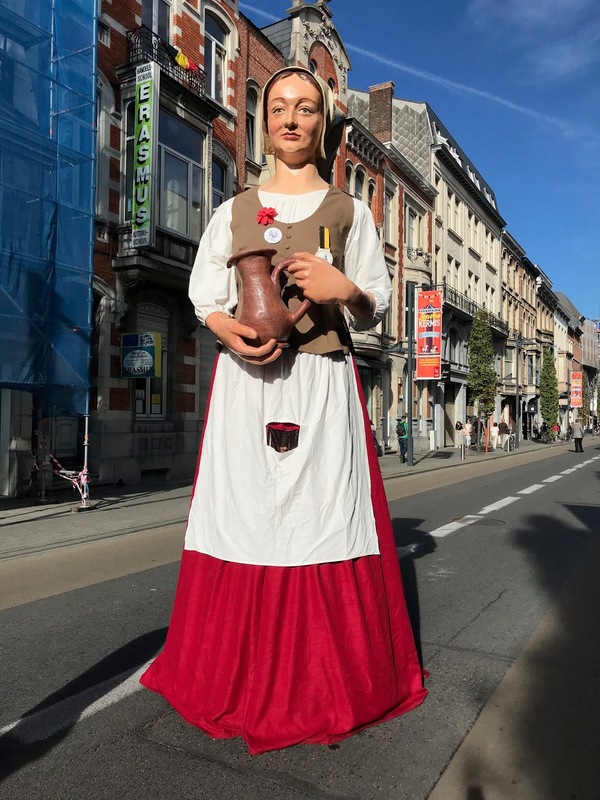 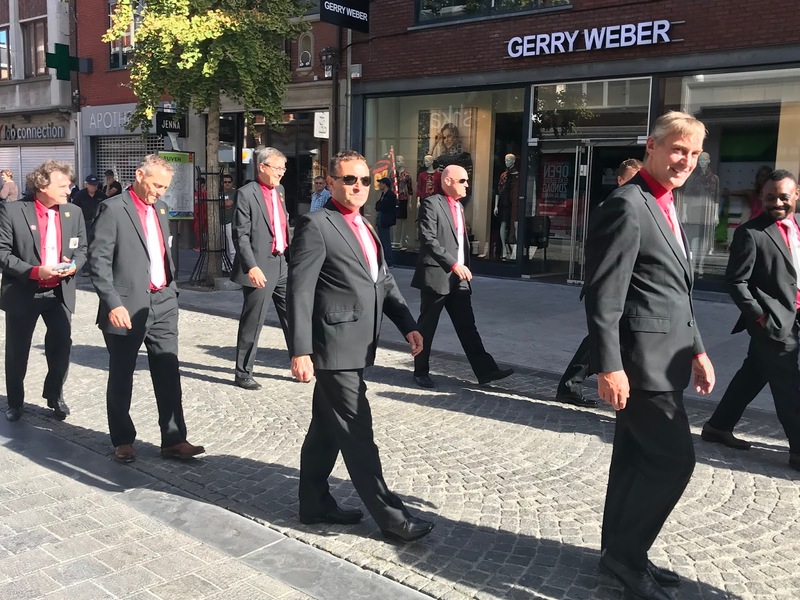 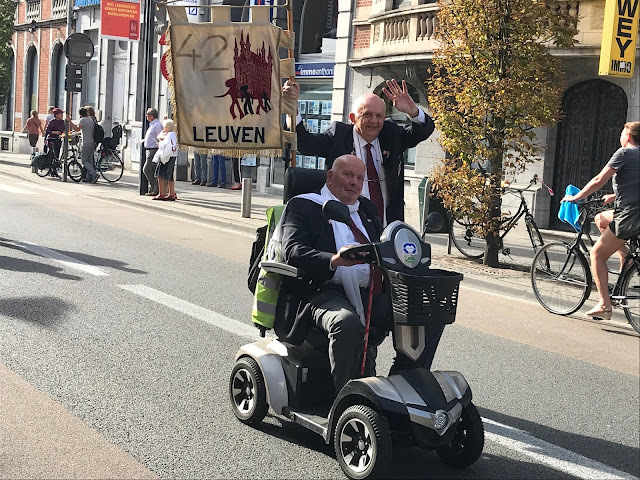 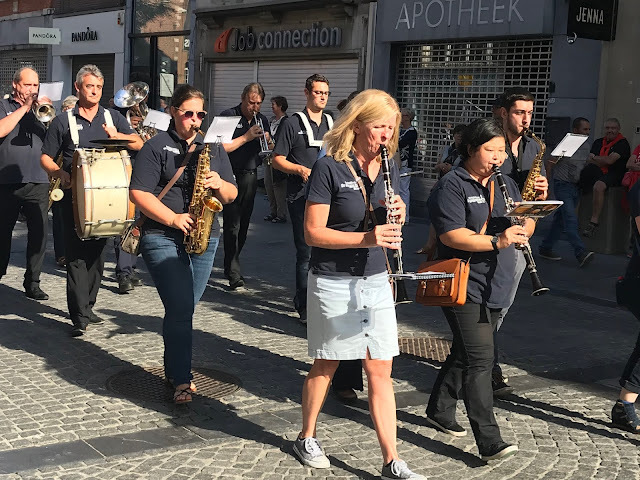 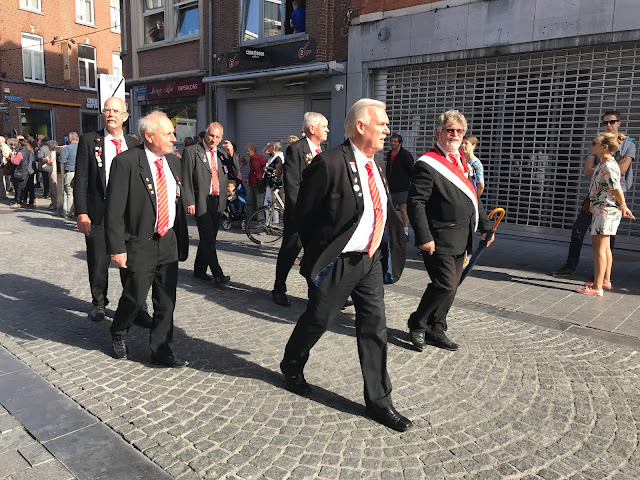 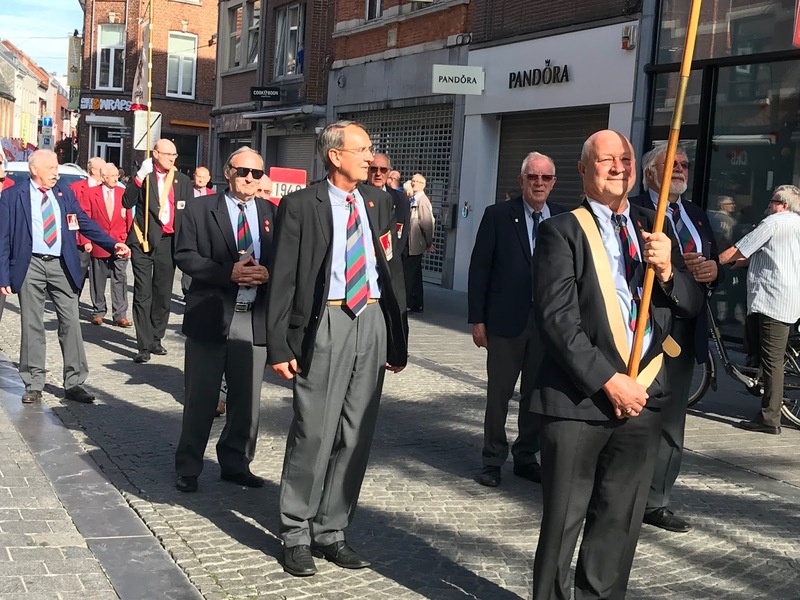 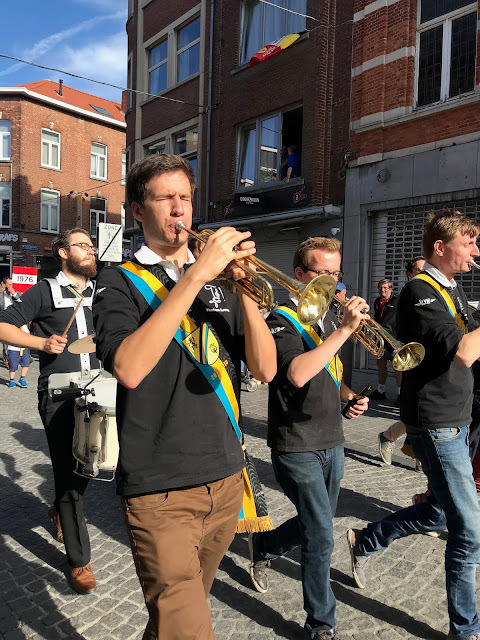 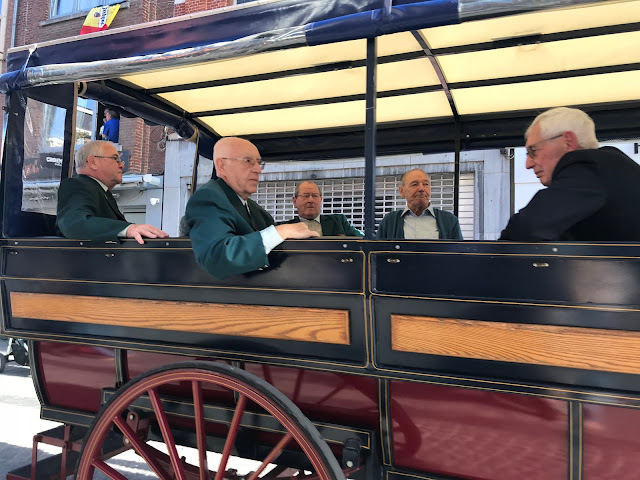 One week after the Abraham celebration of those who turn 50 in Leuven, the traditional Stoet der Jaartallen (Parade of the Men of the Year) goes out through the city center of Leuven. 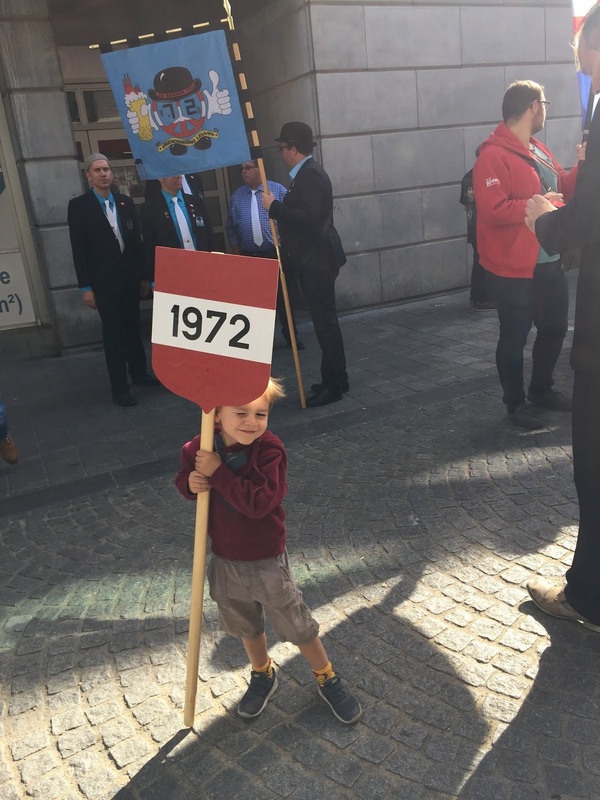 All members of this UNESCO organisation march birth year by birth year - in blocs grouped by the end number of their birth year) - through the city. 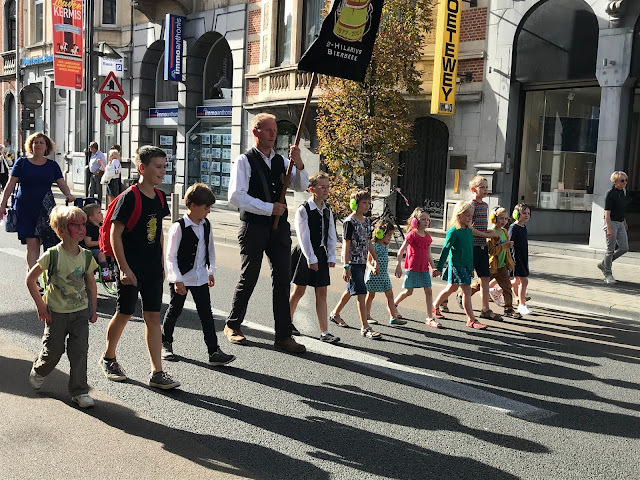 The younger years were marching but the older birth years could ride on one of the many open vehicles in the parade, all of those accompanied by 10 different marching bands and some of the Leuven Giants created by some of the years. 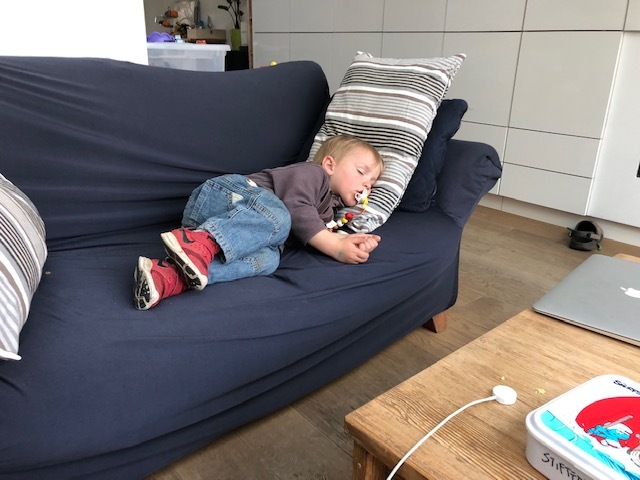 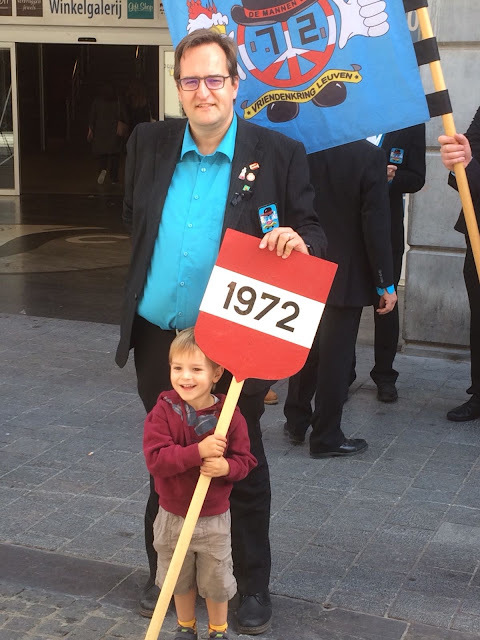 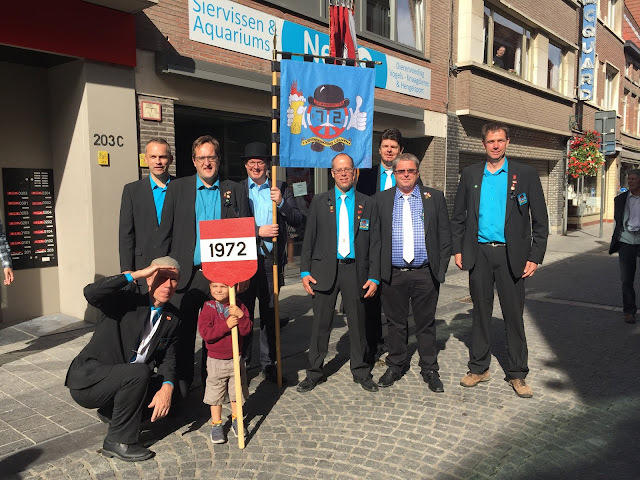 Kabouter joined the men of 1972 to walk along with their birth sign but that turned out too heavy for our little boy quickly. 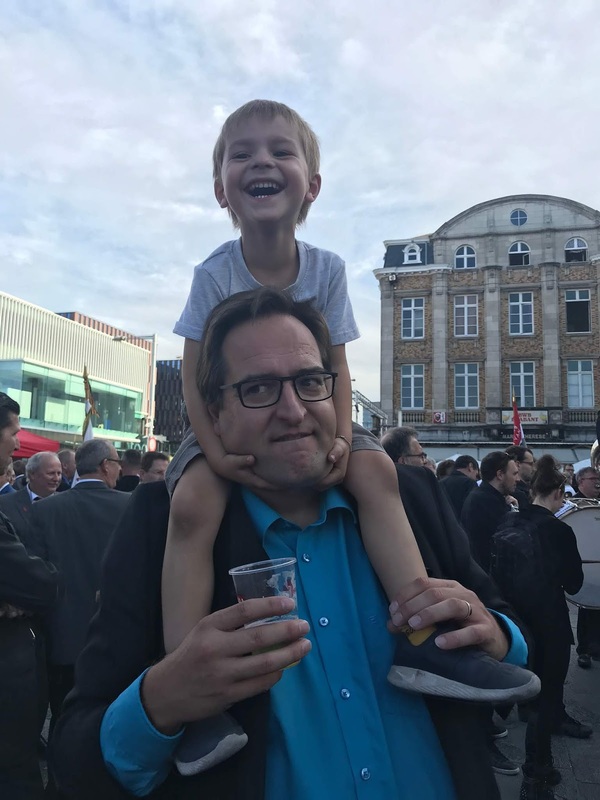 That afternoon, I had gone first with Beertje to the baby party in our family. Then we rushed with the stroller across the city to still meet and see most of the parade. We missed the celebrating men of '58 at the head of the parade but we managed to pick up most of the parade after. 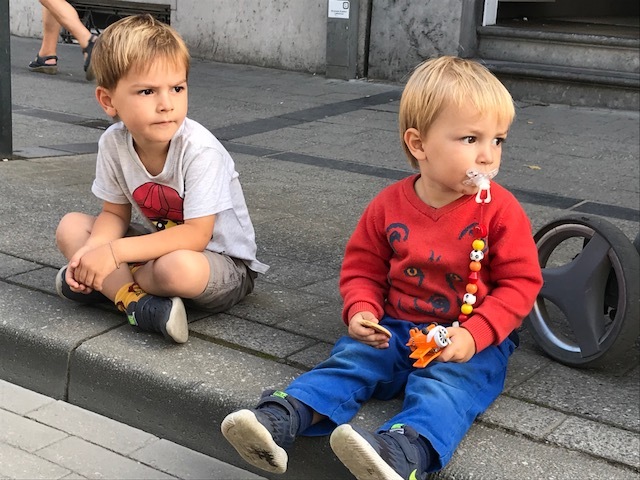 With great anticipation we waited until bloc 2 approached to watch 2 men walking along. 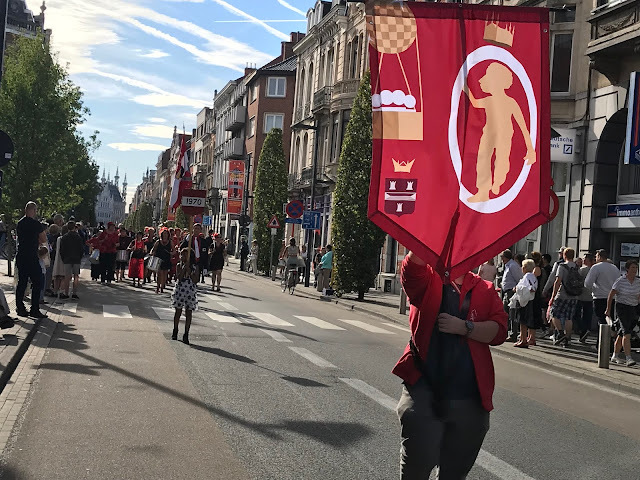 Unfortunately Kabouter was discouraged after carrying the sign that was a bit too heavy for him, so he escaped from the parade as soon as he saw me and then stayed with me to watch the rest of the parade coming by. 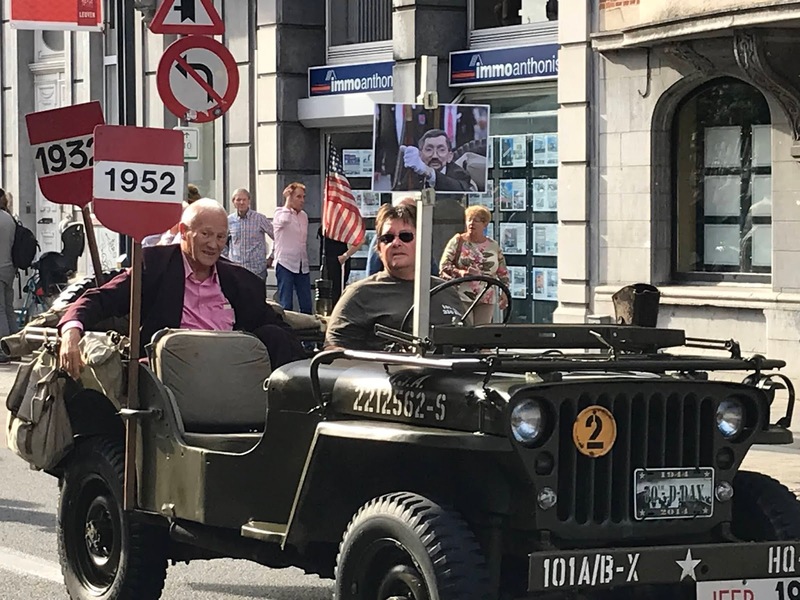 Once everyone had come by, we crossed to the parallel street and watched for a 2nd time most of the parade come by. 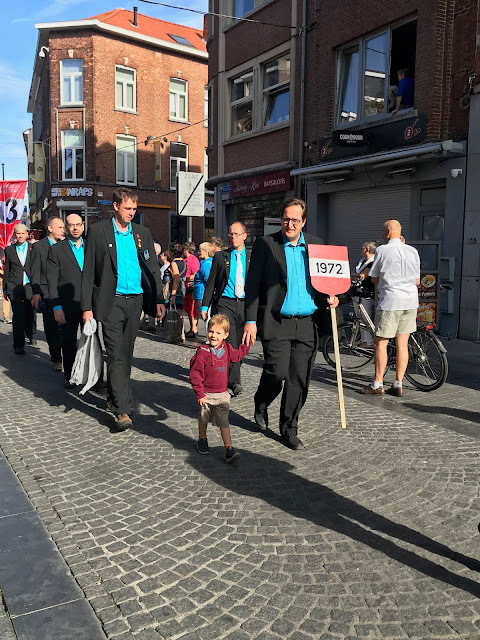 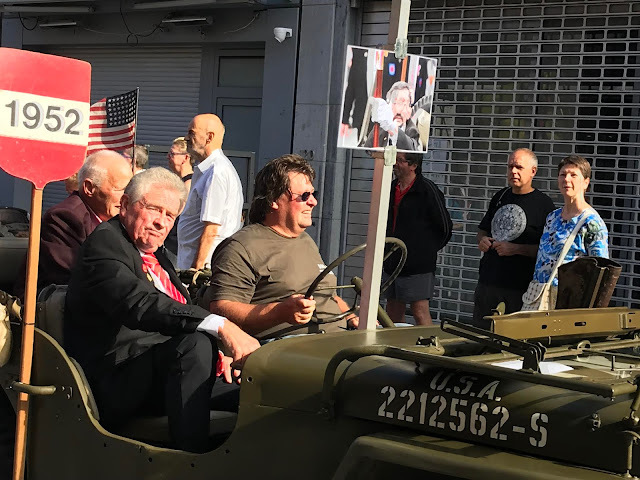 After some resting, Kabouter rejoined his father and the group of '72 again to walk the small remainder of the itinerary in the parade. 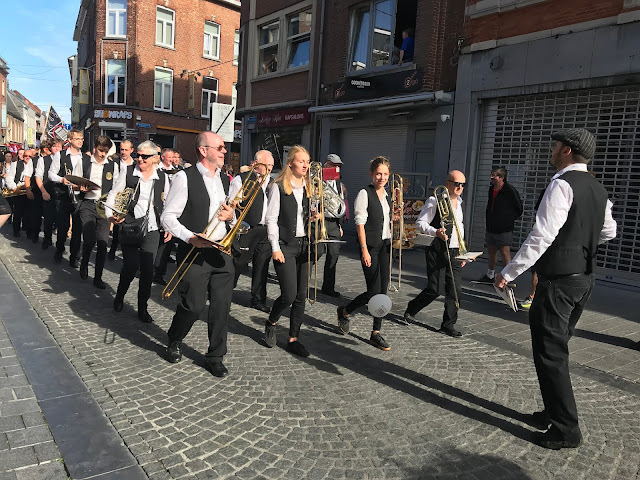 After the parade, we enjoyed the socializing of all the men, and all the marching bands that started spontaneously a sort of fun band battle. 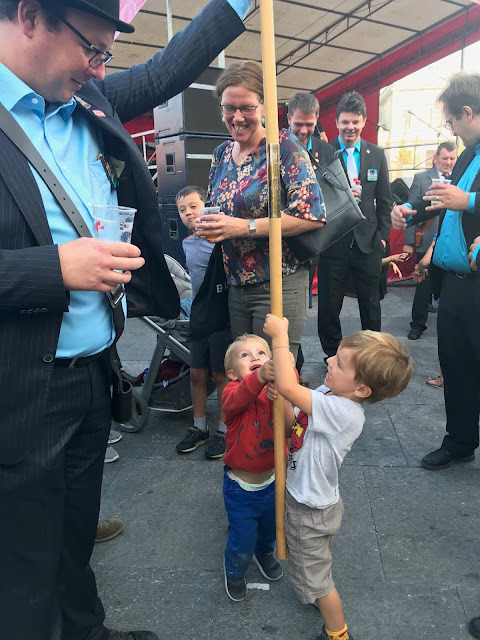 Everyone was having a fun time together.